2017 Was A Volatile Year In The World Of Online Video. Here Are Five Reasons Why. 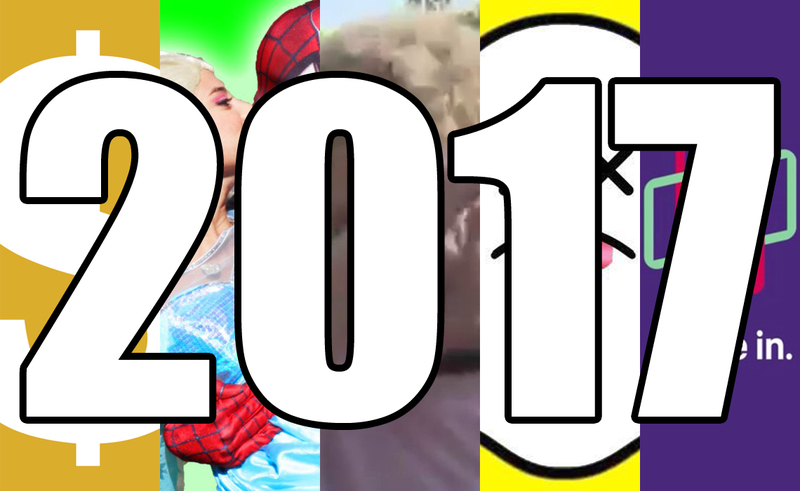 2017 was not the online video industry’s best year, to put it lightly. Creators went to war with the platforms that facilitate their work, sites like YouTube struggled against a growing number of dissatisfied customers, and many fans felt frustrated by forces outside of their control. Much of the promise of 2016, which featured a budding crop of SVOD services and IPO plans for major tech companies like Snapchat, has since come crashing down. To top it all off, the FCC opted to pull down net neutrality, despite vociferous opposition across the internet. So yeah, it was a rough 12 months for many creators, executives, and other industry-adjacent folks. But at least 2018 can be better. By recapping the five major online video trends of 2017, we can glean valuable lessons that can be carried into the new year and can inform our continued analysis of the wide world of web content. Join me as we relive yellow dollar signs, inappropriate Spidermen, and late-night bar scuffles, all with an eye toward the future. It started out innocently enough. In March, a number of major brands, Pepsi and Walmart among them, chose to freeze their ads on YouTube, citing concerns that those spots could be attached to videos from hate groups, terrorist organizations, and other unsavory entities. Facing a boycott that threatened to cost it $750 million, YouTube acted quickly and decisively. It introduced new ad safeguards designed to protect its brand partners from being associated with its most villainous users. That solution worked, and over the next few months, concerned advertisers slowly returned to YouTube. But as one Pandora’s box closed, another opened. In order to enforce its new safeguards, YouTube employed automated systems to flag videos as “advertiser-unfriendly.” In the eyes of that bot, mentioning a tragedy or invoking any sort of violence was enough of an infringement to trigger a yellow dollar sign, resulting in a massive loss of revenue. Across the site, ad-related income went into the tank, hampering the monetary prospects of many creators. YouTube invited wronged videomakers to appeal automated decisions, but even with that help of that tool, some creators have found the deluge of demonetizations to be an impossible tide to stem. DeFranco, who has sold merchandise, organized live events, and built his own business in the past, has long recognized that online video creators need to diversify beyond YouTube, and demonetization controversy provided support for that claim. In search of their own revenue streams, artists have flocked to Patreon, which experienced massive growth (and a controversy of its own) in 2017. At the same time, thousands of creators remain closely tied to YouTube, where they are still able to grow their respective audiences and gather lucrative brand deals, should they be talented and lucky enough. For YouTube, demonetization was a symptom of a user base that has grown so big that it cannot be policed manually. The world’s top video site had to make a change to placate the brands who keep its servers online, and the only way to make that change effective was to implement it automatically. Unfortunately, even Google’s most advanced machines can be error-prone, and its hard to imagine a way for YouTube to please both advertisers and creators within one system. Way back in February, we reported on the growing number of videos that feature family entertainment characters like Spiderman and Elsa. In film, those heroes are fun and wholesome. On YouTube, they are sometimes depicted in wildly inappropriate scenarios that can involve sexual or scatological situations. Later in 2017, we learned how deep the this issue goes. In November, The New York Times published a damning report, uncovering videos on YouTube Kids that were far from family-friendly. Days later, journalist James Bridle’s blog post, titled “Something is wrong on the internet,” delved in a seedy underworld of content aimed at children. Bridle’s report detailed the automated processes uploaders used to exploit popular keywords and gain the favor of YouTube’s recommendation algorithm. Thanks to that strategy, weird, dark, and violent videos ended up in front of the eyes of young viewers. On Reddit, the resulting outcry became known as ElsaGate. Once again, the heart of the problem is that new uploads arrive on YouTube at an unmanageable rate, leaving automated machinery — in this case, the recommendation algorithm — as the sole arbiter of fresh content. Understanding that weakness, YouTube has fought back against inappropriate clips aimed at children by enacting a major purge that has spanned billions of views and by vowing to hire a 10,000-person force of video reviewers. But damage has already been done. Some outlets have gone as far as declaring that “YouTube is not for kids,” and when you watch Spiderman violate Elsa over and over, it’s hard to argue with that hypothesis. If YouTube will regain favor as a purveyor of family content, it will do so with the help of talented, homegrown creators who continued to thrive in 2017. “Slime queen” Karina Garcia and her contemporaries turned an elementary school science project into a massive online video trend. Dan Middleton, who emerged as the year’s highest-earning creator, continued to entertain viewers of all ages within the confines of Minecraft. Pocket.watch brought together several of YouTube’s top channels to launch a new powerhouse in children’s media. So long as parents monitor the video diets of their kids, the appropriate side of YouTube Kids can thrive while enriching and entertaining its target audience. For a YouTube star to warp accusatory narratives in order to strengthen his or her appeal is nothing new. In discussing this topic, for example, I think back to the 2013 saga of the guy who towed Joey Graceffa’s car. This year, though, several high-profile creators made headlines by responding to negative allegations with vicious denials that incited their respective fanbases. First, in February, Felix “PewDiePie” Kjellberg tussled with The Wall Street Journal, which had showcased perceived anti-Semitism within his videos. Kjellberg described that article as “an attack toward me by the media to try to discredit me to try to decrease my influence and my economic worth.” Then, in July, Jake Paul showed no remorse toward his neighbors after they lobbied noise complaints against him and bemoaned the column of teens who constantly hovered on the street outside his house. Finally, in November, influencer couple FaZe Banks and Alissa Violet went to war with a Cleveland bar after allegedly receiving rough treatment from security. In all three cases, the defiant stars used emotional appeals to fans, even when faced with physical evidence against them. Kjellberg went up against the reputation of one of America’s most respected newspapers, Paul countered a KTLA news report that showed clear examples of his offending behaviors, and Banks protested in spite of camera footage that casts doubt on his version of the relevant events. Kjellberg, Paul, and Banks were able to shrug off clear, well-researched attacks because of their fans. No matter what the creators said and how they fought back, they knew their most devoted subscribers would have their backs. Enemies with strong arguments were recast as petty haters with jealous agendas. And it worked. All three of these stars are still stars. They were able to weaponize the tight bonds that form between digital-native creators and their fans, just as President Trump does when he prompts his supporters to ignore the latest bit of fake news. At least Jon Cozart got a good song out of it. If, in 2014, I told you about the 2017 media landscape, would you believe me? Would you accept that in my world Vine is gone, BuzzFeed has hit a rocky patch, and Snapchat has been forced to completely reinvent itself with a new layout? Such is the erratic life cycle of the digital content world, where apps can go from so-called “unicorn” status to Wall Street nosedives in a matter of months. 2017 was particularly unkind to Snap Inc., the parent company of Snapchat. It made its IPO official in February, but the warning signs were already there. The most portentous omen of a coming downfall was the rise of Instagram Stories, which ate into Snap’s audience and eventually accumulated a larger base of daily active users. This shift happened in spite of the fact that Instagram’s version of Stories is a blatant ripoff of Snap’s. Why did users flock to Instagram Stories even though it offered few noticeable improvements over the feature that inspired it? Convenience, probably. Hundreds of millions of people already used Instagram for photo and video sharing, so they decided to use it for disappearing content, too. It certainly didn’t help Snap that Instagram’s influencer marketing industry has thrived, prompting many creators to follow the money. As a result, Snap has been saddled with a flagging stock price and warehouses filled with unsold wearables. It’s the latest reminder that digital-native consumers are a fickle bunch, and any company looking to go public off the backs of those consumers should be bought and sold with care. While Snapchat is at least still kicking, some other 2016 upstarts are no longer around at all. Last year, I noted that the boom of SVOD services, which resulted in the launch of platforms like Fullscreen, VRV, Seeso, Alpha, and FilmStruck, had created a crowded field. Slowly but surely, that herd has begun to thin. Seeso was the first one to go, with Fullscreen following behind it. Some of the players that have stuck around have seemingly been forced to adapt their strategies. YouTube Red, for example, continues to release original content produced by homegrown stars, but it has also scooped up several shows that follow a more traditional Hollywood model. New entrants into the SVOD market probably won’t find the going any easier from here on out. Consumers still have a limited number of subscriptions they are willing to pay for, and it is hard for niche options to make the case that their offerings are worth one of those coveted slots. Even mighty Amazon seems to struggling in such a competitive arena. In this scramble for viewership, the clear winners have been viewers, whose TV and movie options continue to broaden, as well as creators, who have found many more platforms willing to hand out development deals. That trend exemplifies the online video industry as a whole: Kingdoms rise and fall, some people lose money and influence while others gain them, but ultimately, there are still more opportunities than there were are year ago. There are new platforms popping up every month, each of them sporting their own communities of passionate, lovable creators. More people are able to make a living off videos and streams than ever before, and should we keep the lessons of 2017 in mind, there is more potential for growth going forward.